Many people are unaware that there are actually two different types of fractures; full foot fractures that are caused by a trauma, and stress fractures from over use of the foot. While the foot pain experienced with either of these foot injuries may feel quite similar, there are crucial differences that you should be aware of. 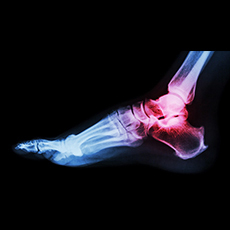 Stress Foot Fracture: A stress fracture may sound non-severe, but it is still a break in the bone or bones of the foot. It’s caused by repeated stress to the bone. Full Foot Fracture: There are two different types of full fractures, both of which are typically a result of a one-time trauma, such as a car crash, or dropping something on the foot. Closed or Simple Full Foot Fracture: A closed foot fracture does not damage the surrounding tissue or skin of the foot. Typically, this means that only the broken bone or bones have become damaged. Open or Compound Full Foot Fracture: An open foot fracture causes damage to the skin and surrounding tissue of the injury. Generally speaking, open foot fractures are more serious than closed, or simple fractures. This is due to the fact that in most cases the break is more severe in order to break through the skin and tissue. An open fracture is also more susceptible to infection due to the open wound and the damage to the soft tissue of the foot. Athletes often suffer from stress fractures, as the pain can be mistaken as a strain or sprain and be overlooked as a ‘lesser injury’. Stress fractures are often harder for the patient to diagnose, because there is no single action that caused the break. Overuse or repeated stress over time are the most common causes of this sort of foot injury. All three of these factors relate to the impact you place on your foot by repeatedly participating in activities such as running or jumping. For example, a hurdler would generally have a higher intensity of impact, but a long distance runner would have a higher duration of impact since they run for very long distances without rest. If you are suffering from any sort of serious foot pain, and you suspect you might have suffered either a full foot fracture or a stress fracture, we recommend seeing a medical professional as soon as possible for an accurate diagnosis, treatment, and rehabilitation plan. if you are experiencing one or more of these symptoms it’s important that you seek the attention of a medical professional immediately for an accurate diagnosis of your injury. If you are diagnosed with either a full foot fracture from some sort of trauma to your foot, or a stress fracture from repeated over use, you will have to make some choices in regards to treatment. Your doctor will guide you with his or her recommendations and treatment plan depending on the exact nature of your injury. It will either be a surgical treatment or non-surgical treatment, but an order to be non-weight bearing will likely follow either treatment option. Surgery is not typically necessary for a foot fracture; only your doctor will be able to assess if you require surgery. If no surgery is required, here are the most important things to remember when you are dealing with a fracture of the foot. Rest: Rest is crucial to helping your body heal effectively. Keeping weight off the injury: Your doctor will most likely recommend that you become non-weight bearing as putting any weight on the broken bone will cause stress to the healing bone, or bones, and slow down the time it takes for you to heal. 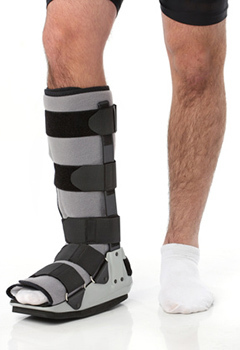 Casts/protective footwear: Your doctor will let you know what type of protection is necessary. They also will let you know how long you should wear your protective brace for optimal healing. 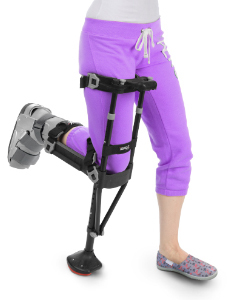 6-12 weeks is the common time frame for wearing a cast. 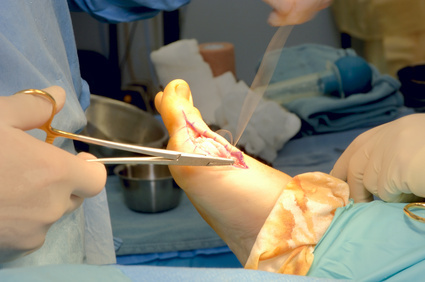 A surgeon sutures a foot. The yellow is an iodine preparation. Bunionectomy. 12MP camera. Surgery is not the typical route for healing a broken foot, but it may be necessary if multiple bones are broken, or if the bones of the foot were injured beyond the point of being able to heal naturally and with correct alignment. 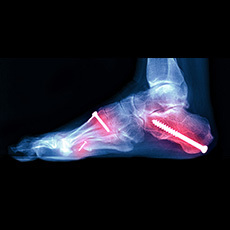 Broken foot surgery often involves fasteners such as pins, screws, or plates. 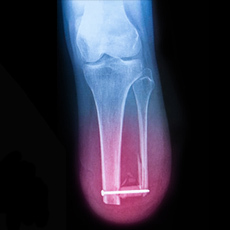 These fasteners provide the necessary support for the bone to heal with correct alignment, which can lower the risk of re-injury later on. After surgery, you will follow the same general guidelines as those who have a non-surgical treatment plan, but you may have an increased recovery time frame depending upon the severity of your break. Listening to the instructions from your doctor is important post surgery, and following these instructions is vital in helping your recovery go as smoothly as possible. As mentioned earlier, it is most likely that your recovery and rehabilitation will depend on your being non-weight bearing for a period of time. With foot fractures this period of time can be 6-12 weeks or longer depending on both your particular injury, and your ability to find the best mobility device for your active lifestyle. Without a good mobility device that allows you to care for yourself and others, return to work, or even just manage your day-to-day duties around your house, the temptation to “cheat” becomes greater and greater. Cheating occurs when you walk on your injury for even just a second to perform a task and can cause additional damage to your foot fracture or re-injury. Cheating can lead to greatly increased recovery times, so let us help you find the best mobility device for your particular injury and your active lifestyle. Traditional Crutches: While crutches are inexpensive and commonly used, they can cause pain throughout your hands, wrists, underarms and chest. When using crutches for walking or standing you will not have use of your hands and arms, making common everyday tasks impossible. 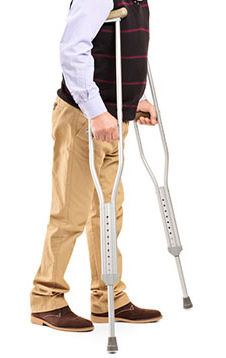 Due to these limitations, using traditional crutches often leads to cheating and increases the risk of re-injury. Knee scooters or “knee walkers” : Knee scooters are becoming an increasingly popular option due to the overwhelming dislike of crutches. 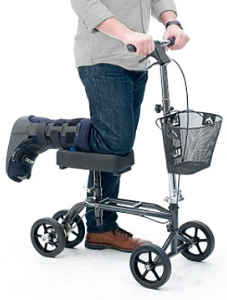 With knee scooters, you kneel on a raised platform with your injured leg, and roll by propelling yourself with your uninjured foot. They are efficient for distances on even terrain, but do not work on grades, in tight places, or on stairs. They are heavy and bulky as well, which makes them difficult to transport. They are quite restricting when performing your daily activities, and you will also need both hands to operate a knee scooter. Similar to crutches, knee scooter users may also be tempted to cheat and risk re-injury. Hands Free Crutch : The 0 is a pain free and hands free crutch alternative that combines the best of knee scooters and conventional crutches. Like a knee scooter, you kneel on a platform, but your weight is supported by your leg, not your hands and arms. Unlike the knee scooter, the iWALK2.0 is lightweight, inexpensive and 100% hands free. It also allows you to walk normally, using the crutch as an extension of your leg, so you can return to your daily routine. It’s fast and easy to learn and use, and allows you to navigate stairs and tight spaces like a kitchen or bathroom with ease, you can even use it while showering. Because the iWALK2.0 allows you to return to your daily activities with ease, the temptation to cheat is non-existent. The long list of benefits makes the iWALK2.0 the best mobility device to use during foot fracture recovery. To learn more about the iWALK2.0, click here. In closing, dealing with a broken or fractured foot can be challenging, but if you’re an active participant in your recovery you will find ways to stay positive while your fracture heals. Follow your doctor’s treatment plan closely. To help your broken foot recovery time, remember to always rest when needed. Also, while you are ordered to be non-weight bearing, it is important to find the best mobility device so that you can regain mobility and independence while taking care of your broken or fractured foot in the best way possible.